Hey everyone! This week I went to two very memorable events: the Family Fun Night at Carson beach and the EMK Institute next to UMASS Boston. The family fun night was my final event of the summer and I have to admit that it was my favorite so far. We got to listen to good music, eat some delicious food, and participate in face painting. It went by so fast that I was shocked when it was over since I was having so much fun doing art with the kids. 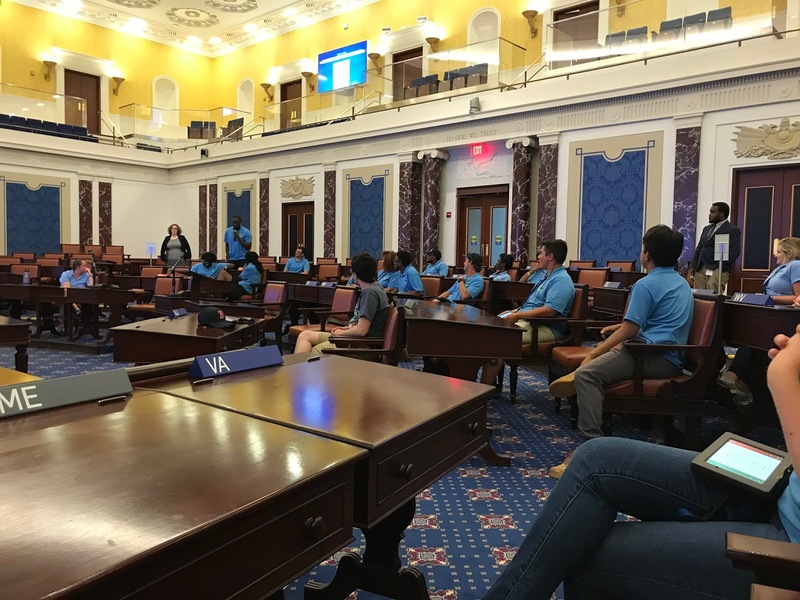 On Friday instead of programming all of the Save the Harbor staff went on a field trip to the Edward M. Kennedy Institute where they have an exact replica of the senate chambers. 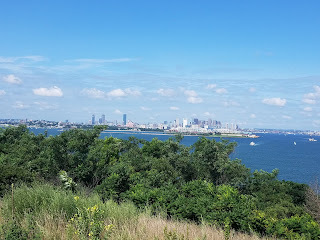 We met at castle island where were able to pick out whatever we wanted for lunch and then we drove to the institute which is behind UMASS Boston. We did a quick orientation and then split into two groups where we were assigned a tour guide. The tour was only about an hour but we got to learn a lot about the way our government works. The main issue of the day that we focused on was the election of Judge Kavanaugh to the Supreme Court. Friday also went by fast and before we knew it we did a mock trial of Kavanaugh’s appointment and we voted that he was not a good choice for the Supreme Court. It was a very informational and unique day because we usually program with children everyday but we were able to interact within the staff and it was a lot of fun. This week at Save the Harbor Save the Bay had to be my favorite one yet! From exploring the island to bonding with my coworkers its been a great summer! To start it off, the week was great as we visited both islands this week and saw yet another almost 1000 kids in the week! With so many camps returning and not visiting us once but twice this summer, its heartwarming to know that we provide these kids with good memories that make them want to return. Wednesday was a great fishing day, we caught a lobster within 20 minutes of our fishing session. We connected with this female empowerment group. Not only had their kids never fished before but some of their staff never did as well. I guided the staffers who had never fished before and caught a couple of Green crabs on the line. Although they seemed scared at first, after teaching them how to hold a crab without getting pinched they actually began to enjoy fishing. On Wednesday we also met some kids from a group called 'CITI', they all came from Cape Verde, which is an island on the coast of Africa, and schooled me on fishing as they actually ate the fish they caught back home. Kaya and I with the lobster caught at Spectacle! Jasseim and I with the rods about to board the boat. Thursday at Spectacle, we played an intense game of kickball. We had about 270 kids on the island that day and with a cool breeze, anything was possible. That anything turned out to be a game of kickball. With Damani on my team against Qalid and Deonte, we played fair and tough yet lost. Although the kids around us didn't take it as seriously as we did, we all still had fun. Carrie, Stanley and I at the Edward M. Kennedy Institute. Friday, we had a bit of a staff day. We went to Sullivan's at Castle Island and enjoyed a lunch of chicken nuggets, fries, milkshakes and pretty much everything else on the menu! We sat outside and enjoyed each others company as it was some of our staffers last day, including my own. After eating and a walk around the beach we headed to the Edward M. Kennedy Institute! The Edward M. Kennedy Institute is by the UMass Boston campus and free of charge to enter for Boston Public School students! 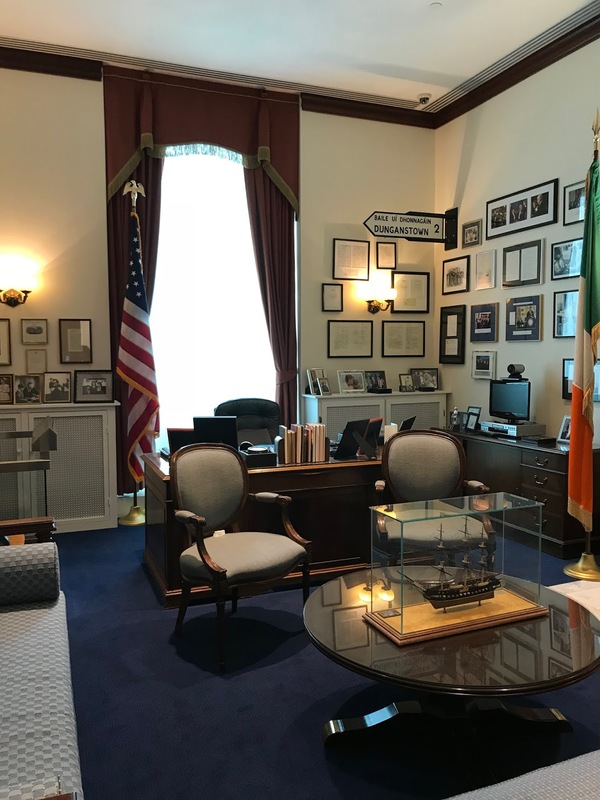 We toured Ted Kennedy's replica office and learned about Congress. We even attempted on passing a bill! (Sprinkles are the best toppings for Ice Cream, nothing else!) At the end of it all we had a mock debate on whether or not Judge Kavanaugh should be confirmed as a Supreme Court justice. And despite everyone's opinions we managed to have a respectful conversation about our thoughts. Everything about this week made me realize that I'll miss Save the Harbor/ Save the Bay, and the friendships that I've made here. As I embark onto my next journey I will never forget what I learned here. Until the next time we'll Haul Away Joe! Before I talk to you guys about this week let’s take it back to Sunday morning to the Seafood Festival, that took place at the Fish Pier. As you guys might know, that was my first Seafood Festival ever in my entire life. I know, I’m literally new in most of the sites and events but ( I like it like that ♫). I was so excited and curious, a lot of things came to mind as I was heading to the event. Like seafood contests, games, activities etc.. My first impression when I got there was “Wow” my eyes were shining like a kid’s first bike. Everything was passing through my mind so fast I couldn’t keep still I just wanted to see everything that was going on and keep watching. It’s weird, but at the same time it’s an amazing feeling being able to get surprised by things the way kids are. Short Story: So, I was at our section doing fish printings on paper and shirts (yes, you read that correct.. we make shirts now!). I was doing my job and everything was flowing and vibing you know, very excited for everything that was going on. Then I see this group of pirates walk past us and I was like “WOOW” (It gets better guys just wait)! So, I heard one of my coworkers saying “Guys look it’s the REAL Johnny Depp!" I was in shock! I could feel my cheeks hurting and covering my eyes due to my huge smile. I spent 2-4 minutes running back and forth from our tent to where they were. I decided to finally ask for a picture, thinking inside my head (OMG I cannot believe I just asked the REAL Johnny Depp for a picture). A half an hour passed and I was still bragging about how I met the real Johnny Depp and was telling my coworkers that I got a picture with him. Until guess what… It turns out that he wasn’t the “Real” Johnny Depp! Painful and heartbroken much? I can’t explain how sad I was because I had been fooled like that. Now this week I was all over in different sites. 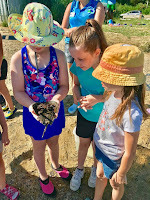 I started off at Blacks Creek where the kids caught a horseshoe crab by the tail. One thing I must admit is that those kids are fearless because horseshoe crabs are scary to me. I was excited for them from afar since I didn't much care for the horseshoe crab. On my last day at Blacks Creek, I got a little bit emotional on the inside because Mya, wasn't there. She was one of the most amazing people I met at this site and I was sad because I thought I would not be able to say goodbye. But when we were almost leaving, there she was. She came to say bye! I was speechless. I couldn't believe how fast it ended. I recalled every moment we spent together since the very first day we met, when she walked up to me and said "Hi, what's your name?" Besides the horseflies and there not being a lot of shade I can honestly say that I'll miss Blacks Creek and the amazing kids that joined the program this summer. They gave me reasons to smile everyday no matter the circumstances. And at the end of the day I'll go home and think of those wonderful moments. Trying to keep the ball up! 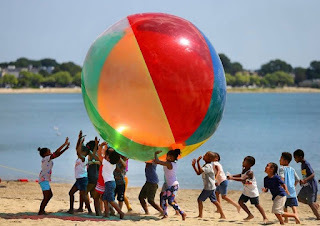 On, Friday I was at the Beach Bash at Carson Beach where I was in charge of Sports and the Huge Beach Ball. My coworker decided to relocate the Sport site near the water because it was super hot and she thought more people would be intrested in "water sports". We were playing baseball with our new friend JayJay. It was a great day at the beach. When the kids started chasing the ball, our staff had to help chase the ball because the kids were very strong and the wind was in their favor as well. We started a new game with the ball which consisted of not letting the ball touch the floor. Now, one thing I'll say don't ever ever try to keep up a huge ball in the air by yourself. Trust me you'll feel ready and stronger than ever but if you're a skinny person like me, that ball will smash you to the ground like it did to me! This week was full of emotions but I prefer to stay with the moments that made me feel happy and most important, with those moments that I know for sure that the kids had an amazing time. If they were happy then there was no way I couldn't be. Have a great day and stay tuned for my next blog! Hey guys! This past week was awesome! 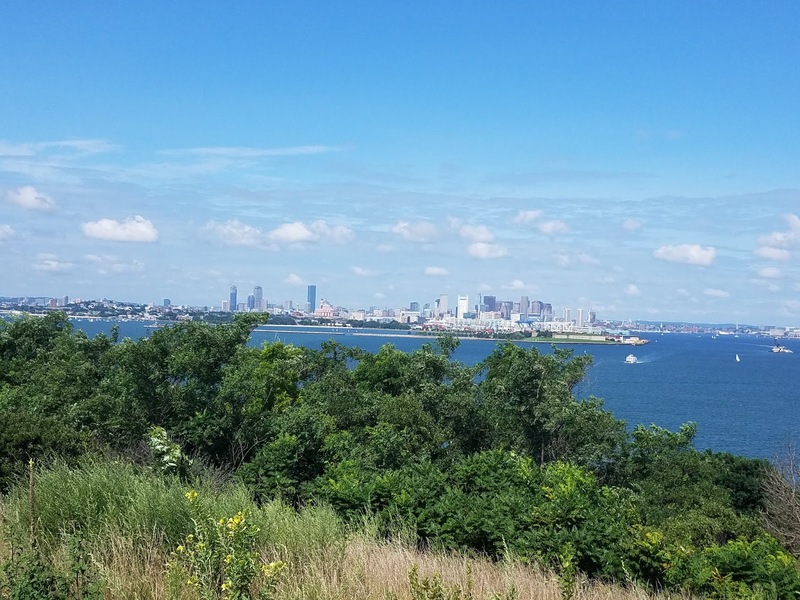 Monday was spent at Spectacle Island surrounded by Save the Harbor staff for our staff day! Since it was pretty cold on Monday I spent my time hiking around the island and taking in the beautiful sights of the Boston skyline. It warmed up in the afternoon so a few brave people ventured into the water (but not me!). In the afternoon I ventured out to the beach and looked for sea glass and relaxed. 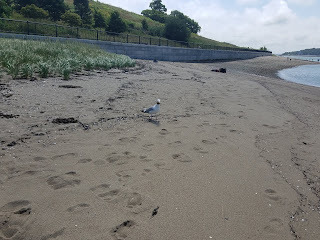 While I was out on the beach a seagull stole the apple I was eating right out from under my nose! Pesky seagull! 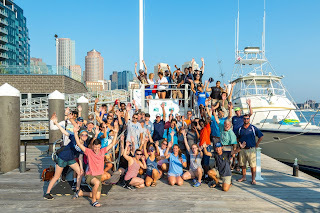 Tuesday I was back with All Access but this cruise to the harbor was one that was meshed with a Share the Harbor cruise so we had camp groups as well as families. It was pretty cold on Tuesday as well so many more kids were into fishing and playing sports than swimming in the harbor. Those who swam were some of the bravest people I had ever met because I was cold just looking at them! The Beautiful Boston Skyline from Spectacle! I was also able to go to Piers Park this week and celebrate their last week of camp with them! 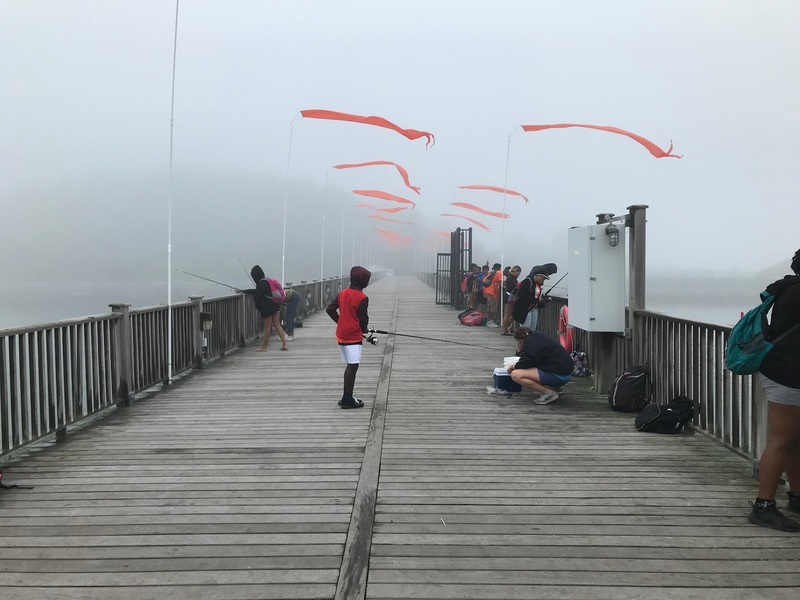 Wednesday was such a rainy day that it was difficult to get the kids excited about going onto the dock once the storms cleared! 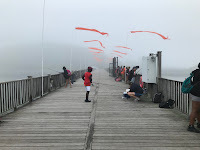 Once they were sure they would not get rained on they all eagerly came down to the dock and either fished, went sailing, kayaked, or waited to pull up the crab traps. Thursday was similar to Wednesday except it was much colder so no kids wanted to go kayaking for fear of getting wet and being cold. Friday however was so hot compared to the rest of the week. All of the kids at camp were eager to have the best end to the summer yet.. water fight on the dock! Everyone wanted to be sprayed with the hose or be out on the kayaks having their own fun in the water, even some of the Save the Harbor Staff got in on the fun! Everyone went into lunch soaked but it was such a fun way to end this camp. I'm so glad I got to be at Piers Park for their last week! 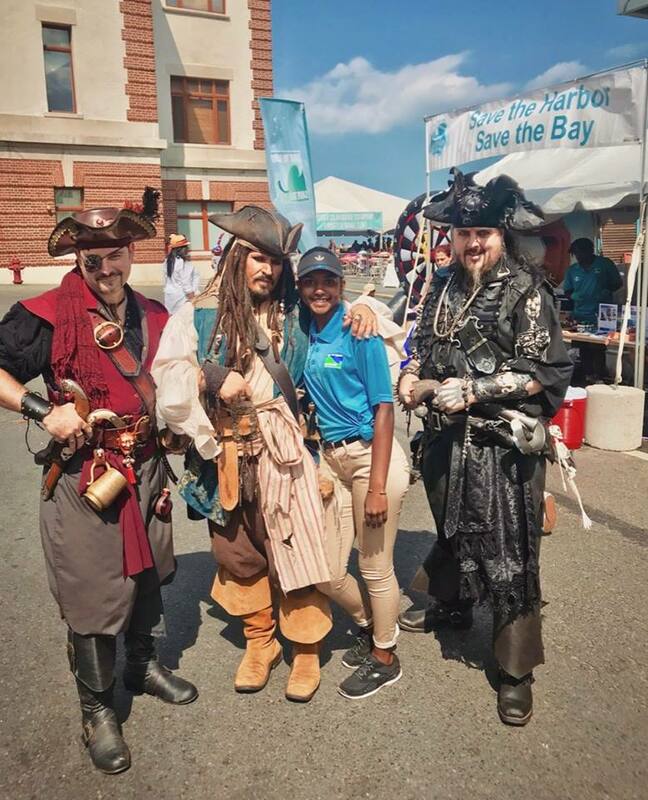 Saturday was the End of Summer Bash at Atlantic Wharf! 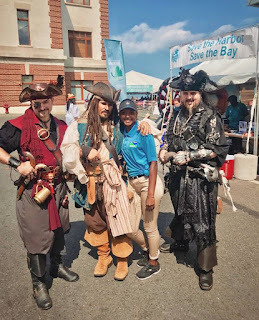 This was a cool event to work because I hadn't yet worked at Atlantic Wharf this summer so it was great to be somewhere new. There was a great band that performed at this event and got all of the kids up and dancing in no time! The beginning of the event everyone was either getting their face painted or eating the wonderful food Boloco had provided. Then everyone wanted to check out fishing, make a fish print, and find out more about what our organization does. Overall it was a great event and I'm so happy that so many people came to participate! Catch ya out on the harbor for my last week! We entered this week with some interesting weather. Both Monday and Tuesday were incredibly foggy and added a sense of mystery while hanging out on Long Island at CHV. At the end of the week, we took a trip to the Edward M Kennedy Center to learn about our legislature. A couple overcast, foggy days were well needed after being hit with day after day of scorching heat. 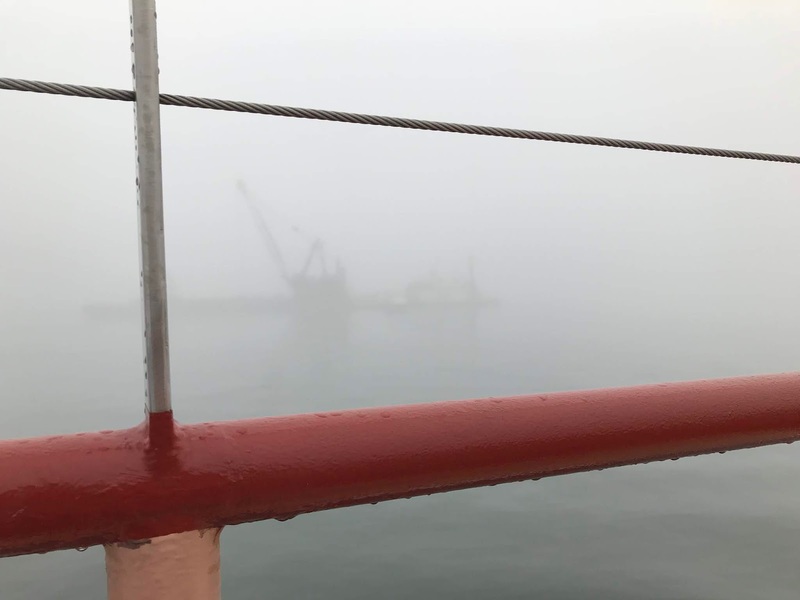 The fog had gotten so thick at times where if you were at one end of the pier, it was almost impossible to see the other end. Despite the ominous weather, we still managed to have a great time fishing! We didn’t have much luck on the poles, but we had some crabs and even got to observe a seal swimming about the pier. Later on in the week the gloom lifted and brought back some nicer weather to the harbor islands. After a day of no fish we were shocked to find dozens of crabs in the trap which captivated all of fishing club. We participated in an activity that was a little different from things we had done in past weeks. 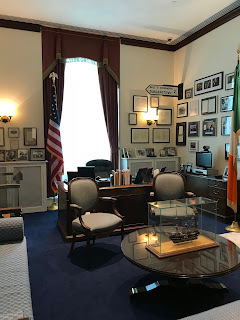 We got to tour the Edward M. Kennedy Center and learn all about the institution that EMK loved, the United States Senate. Although this wasn’t exactly intertwined with Boston Harbor, it is important that we understand the way our government works. Landmark legislation has led to many environmental successes. Environmental legislation dates back over 100 years including the Clean Air Act, Clean Water Act, Endangered Species Act and many others. The institution of the Clean Water Act allowed for the cities of Boston and Quincy to sue for the clean up of Boston Harbor to turn it into the place we know today. It was a pleasure to participate in the tour of the EMK Center and I was grateful to have received a lesson on how our government works. Next week will be full of exciting activities, from staff day on Monday to the two fishing trips scheduled on Tuesday and Wednesday! With another week down in the Summer, almost wrapping up, we continue to have new fun experiences! This week we visited both Spectacle Island and Georges Island and had a mini Beach Bash at Carson Beach to round out the week. This week I was at All Access once again! And I continue to have the time of my life here! This week was very eventful in the sense that Tuesday was our annual fishing derby! Call time was at 7 am! And we had the privilege of being on the boat with Captain Charlie! After 5 hours of fishing and recklessly eating twizzlers, we caught a couple of flounders and skates. The best part had to be the entire experience. 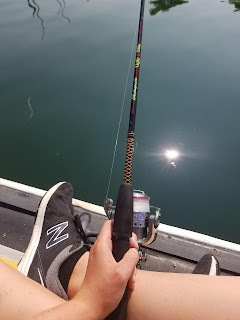 It was my first time fishing off a boat into the middle of nowhere (which was actually Quincy) and not off of a dock drop casting. Although I was a very unlucky fisherwoman who had her bait stolen not once or twice but countless of times, it was cool to see the fish at the top of the water rather than the bottom. We were in their territory, and I gained an appreciation for fish and their ecosystems that I did not have before. Also, I appreciate fishing way more because you have to have patience for that which I have not mastered yet. The rest of the week seemed to have flown by as we continued our regular programming at All Access. 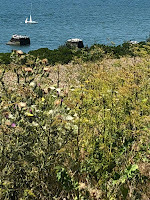 Thursday we went to Georges Island and fished with many excited little kids. When we got off the boat, it seemed like there weren't that many kids, but when we set up fishing, there were kids everywhere. 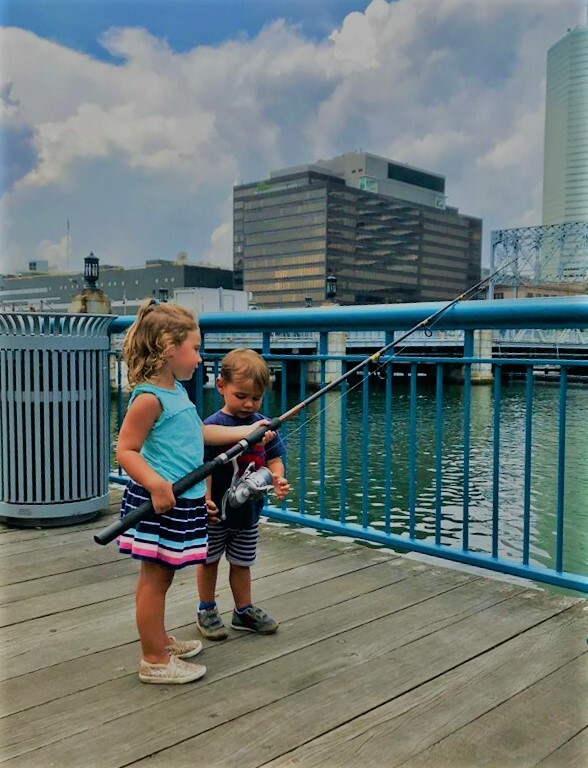 I've noticed about myself that I like to give every kid a chance at fishing because I don't know how hard it is for some of them to experience fishing. So I try to do my best to allow everyone to fish. When they're not fishing they're at the touch tank or pulling up one of our various crab traps. If they can't at least fish, then they could hold a crab or learn the difference between a male and female crab. Many of which like to use the term "Can you feel it now, Mr. Krabs?" which I get is a SpongeBob reference, I just don't understand how every kid says it in sync after catching a crab. It makes me laugh. 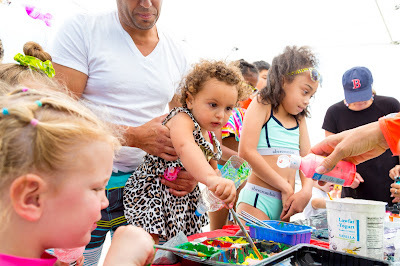 Friday was the mini Beach Bash at Carson beach. 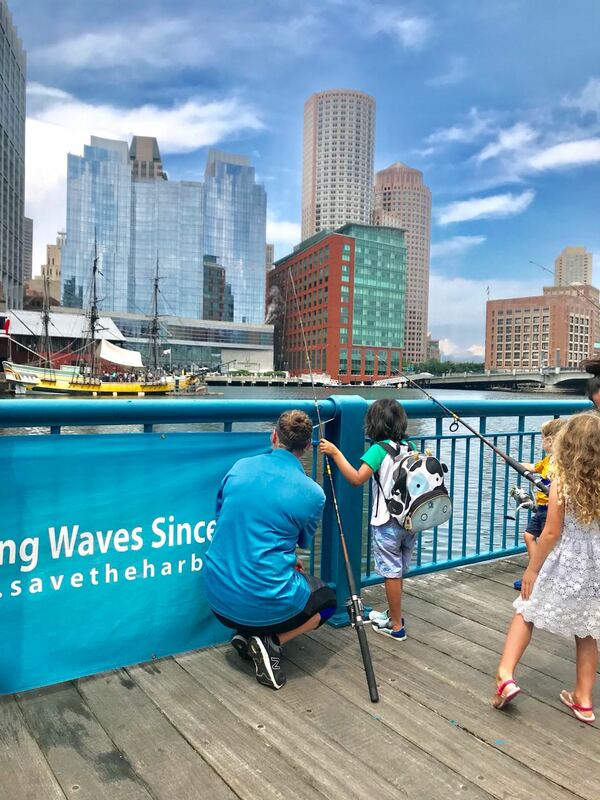 Aleena and I took the time and dedication to create a Save the Harbor/ Save the Bay banner. While we worked on the banner, others were fishing or playing sports, serving food, blowing up the HUGE beach ball (me), or just running around and playing in the water with one of the hundred kids that showed up for the event. We ate some amazing hot dogs, sang our verse for "Haul Away Joe" and had a great time. Personally this week was one of my favorite weeks because I got to interact with so many kids and create a bond with them! I hope I continue making these bonds as I go into my final week working here and enjoy my next week even more than I enjoyed this one! Aleena and I with our Save the Harbor Save the Bay Banner! crabs we had caught to them so these kids could see the crabs while waiting for the museum as well! Trying to catch a lobster the size of the milk bottle! When the next few days came I immediately knew I had taken the fabulous weather from Monday for granted because it was back to being hot and humid. Even in this weather there was one boy who stood and fished with me for a long while, talking about all things marine! 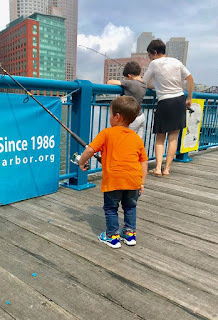 The topic of this discussion was about the huge lobster Save the Harbor had caught at Atlantic Wharf a few weeks prior. I had told him about this massive lobster they caught that had claws the size of my head and he said "what if that lobster was as big as you?" and "what if it grew as big as that milk bottle?" (referring to the Hood nearby). This went on for a few minutes but ended with "what if the lobster was as big as the world! There would be no room left for the people!" I enjoyed helping him fish because I forget how imaginative the brains of children are and it was refreshing to hear some of his ideas. We then caught my favorite fish (a baby flounder!) and an amazing crustacean (a baby green crab!) 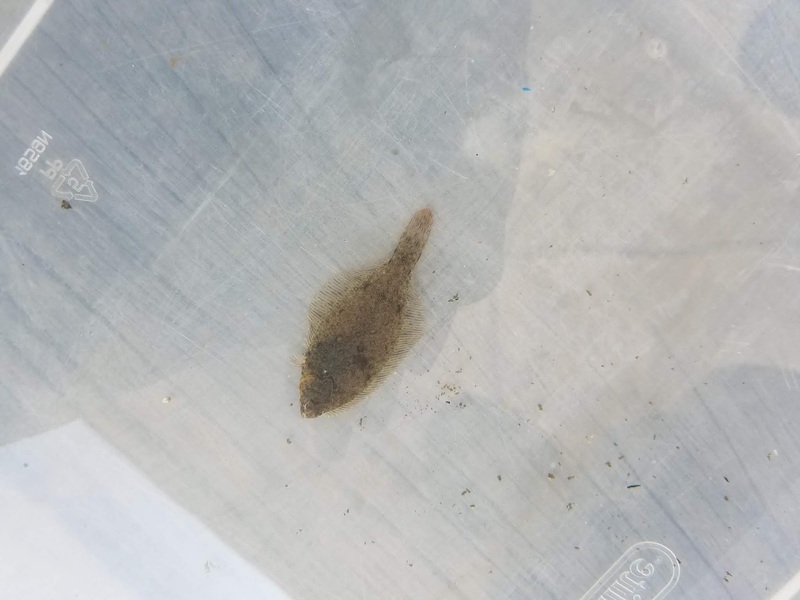 and had a baby touch tank! This week David Lee came to speak with us about his career and showed us some of the unique buildings he has designed throughout his career. I found his talk interesting since I do not know a lot about architecture so it was a great way to learn about another career. We then were able to visit the Edward M. Kennedy Institute for the Senate which was a really cool experience because we got to go into an exact replica of the United States Senate Chamber and participate in a vote similar to how they would in the true Senate. It was a great end to the week! Catch ya out on the harbor! This week was an exciting week. 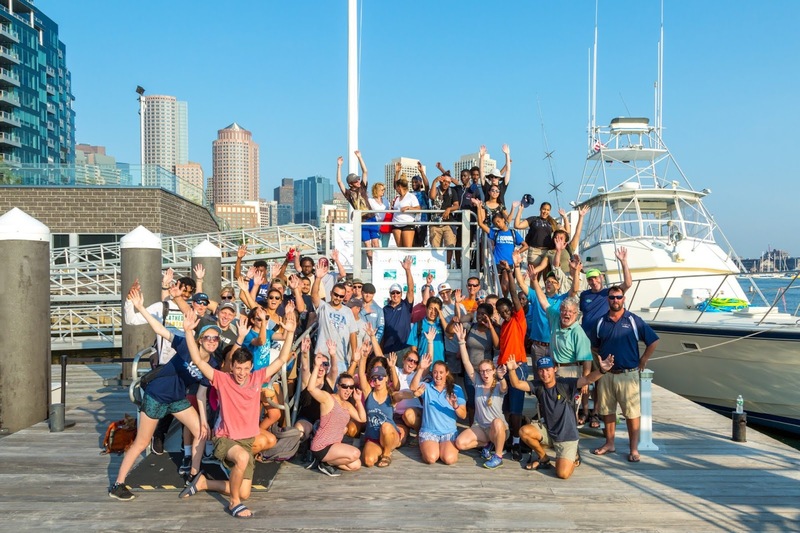 On Monday, we led a Share the Harbor cruise to Georges Island with 314 people. Tuesday through Thursday, we were on Spectacle. On Thursday, it was pretty crazy because we caught a lobster. I was sitting by the touch tank with some kids, when I heard another kid yell, "I got a lobster! I got a lobster!" I automatically assumed the girl got a crab, and was confused, but when I looked over, she actually had a small lobster attached to her rod. Surprisingly, it held on as the rod was reeled in, and we put rubber bands on its claws before putting it in our touch tank. Later, before we left Spectacle, we dumped the rest of our crabs out back into the ocean, but gave the lobster to some New England Aquarium staff. They often also have a touch tank at Spectacle, and they were thrilled at our "gift!" They promised to return her in the ocean when they were done. On Friday, we all met at Sullivan's for a quick lunch. We ate some delicious food--lobster rolls, clam strips, crab cake sandwiches, fish & chips, onion rings, fries, and frappes! 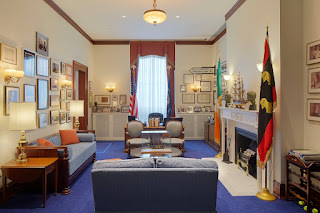 Afterwards, we drove over to the Edward Kennedy Institute (EKI) to learn more about the role of Congress in U.S. politics, and Edward M. Kennedy's role as a previous U.S. Senator. I had never gone before, and was unsure of what to expect. I found myself having a lot of fun and learning some really interesting things about EMK and U.S. history! 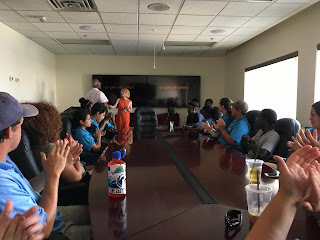 We all held tablets and acted as Senators-in-training as we listened to our tour guide explain everything from how a bill is introduced to EMK's influence over many North Americans. 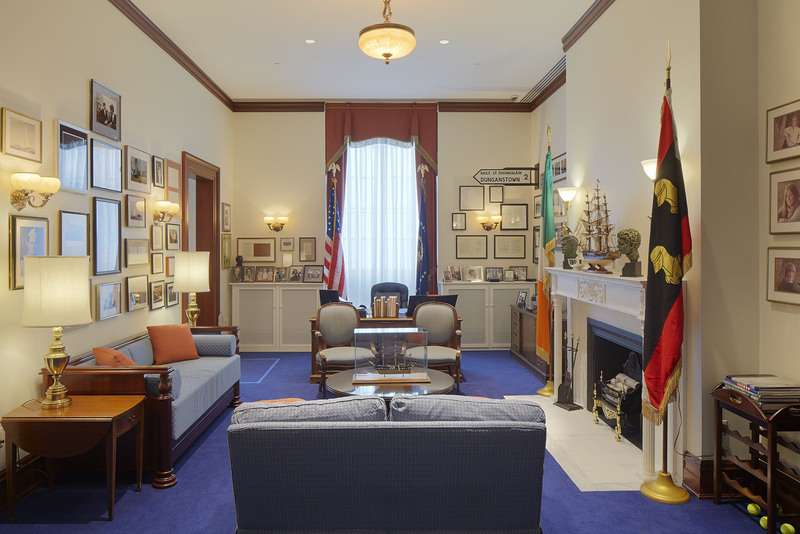 At the end of our tour, we all headed into a room that was a replica of the official Senate chamber! It was much smaller than I expected, but extremely cool nonetheless. A couple of actors introduced a mock introduction for the pending nomination (PN) of Brett Kavanaugh as Supreme Court Justice, and encouraged us to participate in the activity. A few people argued for or against Kavanaugh's nomination, explaining the various pros + cons of his possible appointment. It was very entertaining, but also allowed us to really get an opportunity to think more about current U.S. politics. It was a great way to end the week, especially because right before work, I voted early in the state primaries! Yay for civic responsibility! Are we in the real Senate chamber?? This summer, Save the Harbor/Save the Bay has had the opportunity to work with acclaimed environmental artist, Robyn Reed, and introduced the youth, teens, and families taking part in our Youth Environmental Education Programs and Better Beaches Events to her revolutionary art installation, Changing Course. Changing Course takes an innovative approach to recycling by using plastic water bottles collected from the region’s beaches and waterfront to create art installations that transform these reclaimed water bottles into a fish. When strung together, the individual sculptures create a powerful school swimming upstream against the tide of plastics that are polluting our oceans. The idea behind the art piece is to inspire a “change of course” in how we think about single use plastics, such as water bottles or plastic straws, and encourage the public to become more proactive with limiting their use of these plastics and recycling them when they are used. Also, through art installations such at this, hopefully the public will become more aware of how much of the trash we use every day can end up in our oceans and how quickly it can accumulate. The installation was inspired by Henderson Island, “the most polluted, most remote island in the whole world,” a tiny landmass in the South Pacific Ocean which has been found to have the highest density of debris recorded anywhere in the world, 99.8% of it plastic. This art installation is made up of about 2000-4000 plastic drink bottles and has been displayed in Christopher Columbus Park, at Boston GreenFest, and is currently on display at Boston City Hall as well as in Save the Harbor's Boston Harbor Pop-Up Museum at 226 Causeway St. The partnership began with the artist holding a workshop for Save the Harbor's youth staff at the Pop-Up Museum this past spring, and has since brought the interactive project to Winthrop Family Day at the Beach, Tenean Beach Day, and KidsFest in Quincy, to spread awareness about this important issue while bringing a fun and engaging art project to the beach. If you are interested in learning more about Changing Course or would like to contribute your own plastic bottle sculpture to the project, Robyn will be at Dorchester Beach Day on August 25th from 3pm-5pm as part of Save the Harbor’s Life's a Beach programming, made possible through Save the Harbor and the Department of Conservation and Recreation's Better Beaches Program. 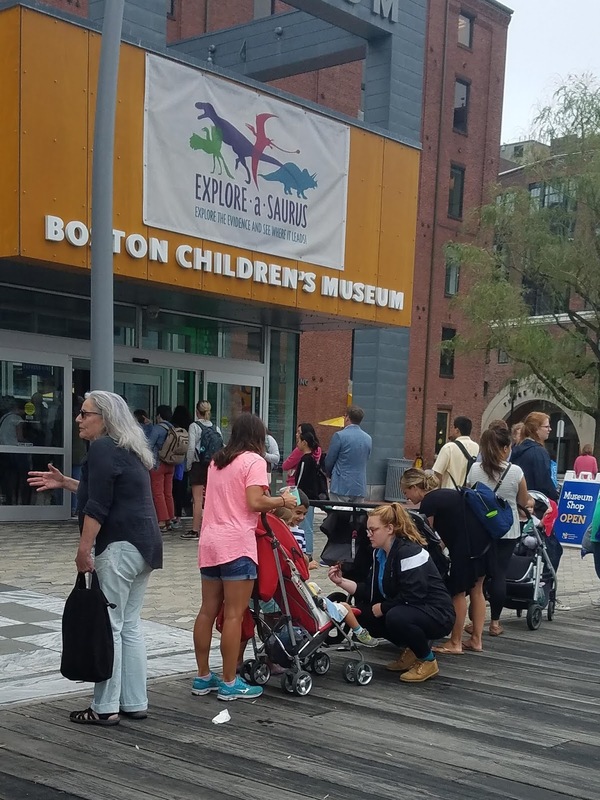 Or stop by the Boston Harbor Pop-Up Museum any day between 10-4pm and Sundays 12-4pm. Well, I was back at Children's this week! Although it was an eventful week. We had got a ton of people that wanted to fish throughout the week. We even got a striped bass! The story behind catching it is the crazy part of it. The striped bass was caught, not by an adult, not by our staff, but by a 9 year old Japanese girl. How crazy is that? It was a 16-inch bass, so not legal to keep, but still cool. But that's not the end of that part of the story! 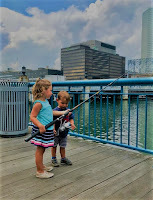 When I asked them if they wanted to try fishing, at first it was only the boy, but after two tries, the girl wanted to as well. I tell you, when it hit the bottom, everyone thought it had gotten snagged on seaweed or a rock, which is not uncommon, but no, it was bent and perfectly straight without pulling on it. A fish had grabbed the bait as soon as it was put into the water. So, we reeled it in as close to the dock as possible, without pulling it out of the water because the tide was too far out. At first, we tried to get it into a bucket so that we didn't risk the line snapping, but after about 3 or 4 minutes of failures, I decided to just strong man pull it up. Still felt lucky because I don't know the test on the lines (how heavy something can be so the line wouldn't snap). We made sure to let the girl hold her fish and get a picture of her. I was probably the next most lucky person there, because of them stopping and trying fishing, I had a chance to practice my Japanese! I recited my jikoshokai, which roughly translates to "self introduction" and screwed up a tiny bit. I don't know whether they were being nice, or they truly thought that I did well... It may have been the fact that I tried at all, especially when the majority that they hear is English. 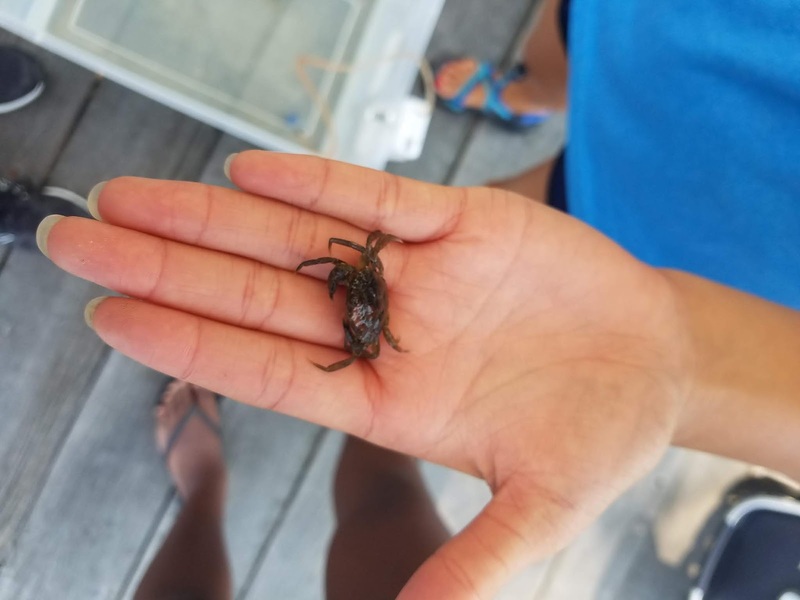 Another group was at Atlantic Wharf this day, and since they were having trouble catching crabs at the beginning, we gave them some of our crabs for their touch tank. Later, after we got the fish, they came back. I was a little sad to see the fish go, especially since we had caught it at our sight, but it was nice that we got to share it with other kids! 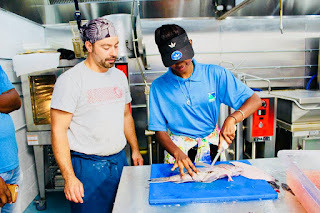 Tuesday we were able to get a chance to see how to prepare flounder! We got to watch an amazing chief, by the name of Basil, prepare two flounders right in front of us! One of them, he decided to filet and pan fry, while the other he wanted to just cook whole! Lemme tell you, if you were in that kitchen and smelled that, your stomach would be roaring to eat it in no time. When I say this, I mean it. When I left my house, I had just eaten, but as soon as these flounder hit the oil, my stomach was rumbling for food. 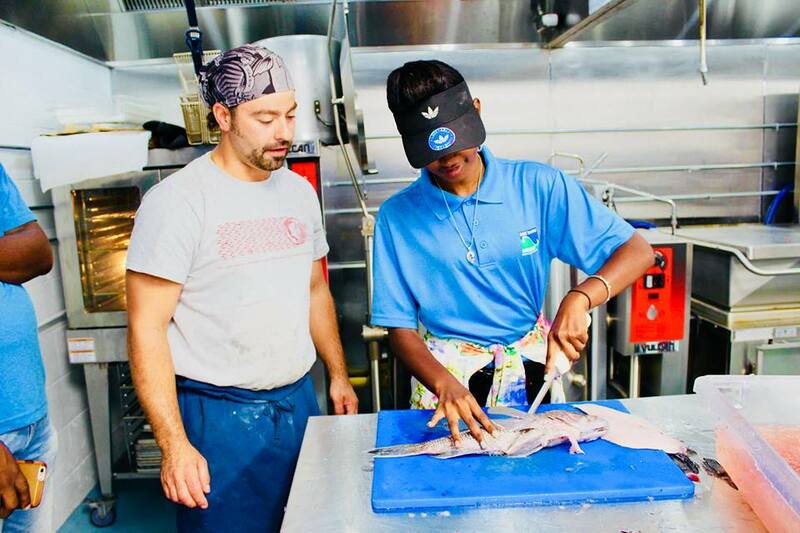 Looking at the uncooked fish, you would never have known just how good that fish was going to be! My only wish was that we had a bit of rice to go along with all of it. The first step Basil did was to filet the smaller of the two flounder. He showed us how to correctly filet one because they are very weird due to being a flat fish and not having the same amount of meat on each side. The first thing you do is to cut right at the shoulder... "Wait, fish have shoulders?" is what you must be asking yourself right now, but no, the shoulder refers to the part right next to the head of a fish where the gills and meat interact. So, a nice cut there, and then made a nice neat slice down to the tail. At this moment, both him and Bruce reminded us about the importance of a sharp knife when doing this. As we watched, Basil told us to listen to the knife scraping along the bones. If you ever dragged a stick or bottle along a metal fence while passing it, that is exactly how it sounds. The next part was to skin the filets, and he did this by cutting a small piece at one side of the filet and sliding his knife along the skin under the meat, and separating them. Moving those aside, he got rid of the guts and gills from the rack, the bones, head and tail, and threw it into a pot of water to make a fish stock. Final look of the Whole Fish! The second, and larger fish was going to be cooked whole. For this, Basil cut into the fish and sliced it open in order to remove all the guts. What a sound that made! But my did that fish look tasty then! Open stomach, guts falling out, and a nasty liquid that was probably from the stomach. At that point, I think everybody was hungry from the anticipation. Basil asked us if we wanted to keep the head on or not when we cooked it. Everybody said no, but for me, I think it would have been kinda cool for it to happen, but unfortunately, I was alone in that thought, so we cut the head off. After that, Basil cut the tail and fins off just so we didn't have to worry about them in the food. The final part was to scale and wash the fish. For the spices on the fillets, we salted and peppered them, and "derging," which is just putting the fish into flour, and then pan frying them. 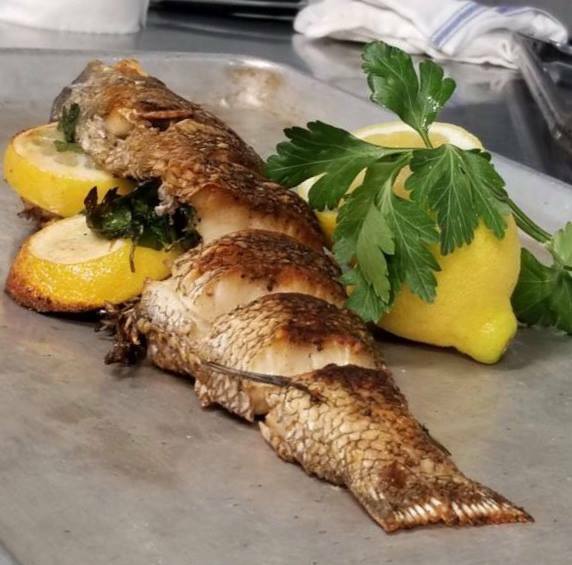 For the whole fish, he cut slits into the fish so it would cook faster, and put lemons, parsley and thyme into the stomach cavity to give it some more flavoring, but again, salted and peppered. 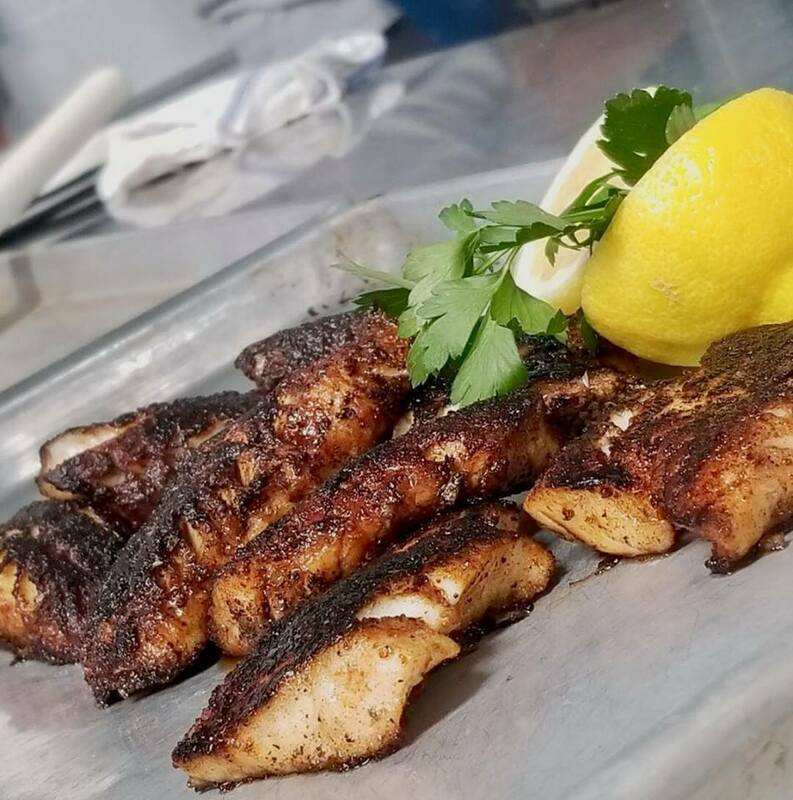 For the whole fish, we started with pan frying to get a nice color and texture on both sides of the fish. but once it had good coloring, Basil placed it into his oven, which was not working 100% but got the job done, and let it sit in there for the remainder of the time until the fillet were done cooking. I'm back and better Bloggers! Now at All Access! We meet the camps at the Blue Hills Bank Pavilion, which is so cool because I know growing up I never even stepped foot in to an area such as the Pavilion. 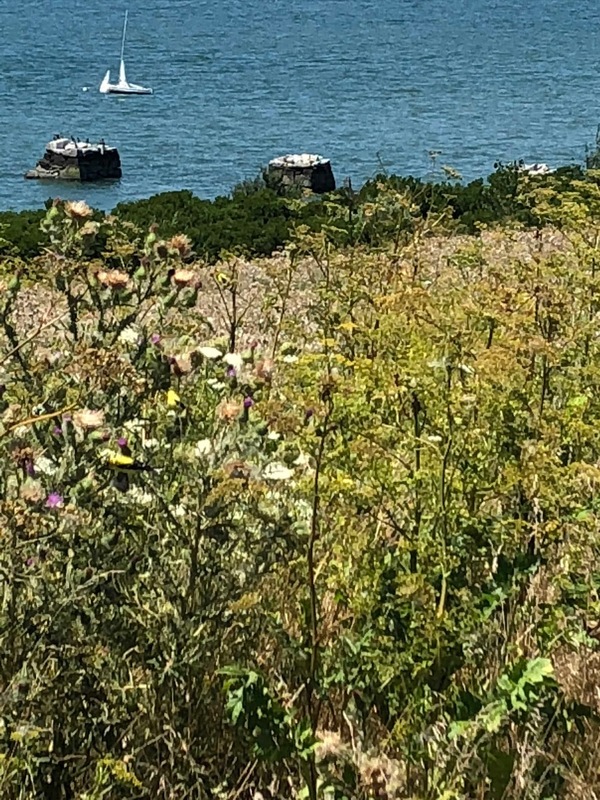 We greet the camps and hear a story about the island we're about to explore, which can be either Georges Island or Spectacle Island. It's a humbling experience interacting with the kids here because its when they're the most enthusiastic. Some kids, like many from this week, have never been to Spectacle Island, and were just as curious and excited as I was. I found pleasure in connecting with them because we had something in common: It was our first time! After we learn about the islands we begin our journey to the boat. We walk alongside the kids, some in front to guide and some in the back to observe. And all you hear are kids fascinated by the contraptions we have in our hands. "Is that a crab trap?!" You hear from one end, and "WOAH a fishing rod!" from another, as if we're on our way to save the world! 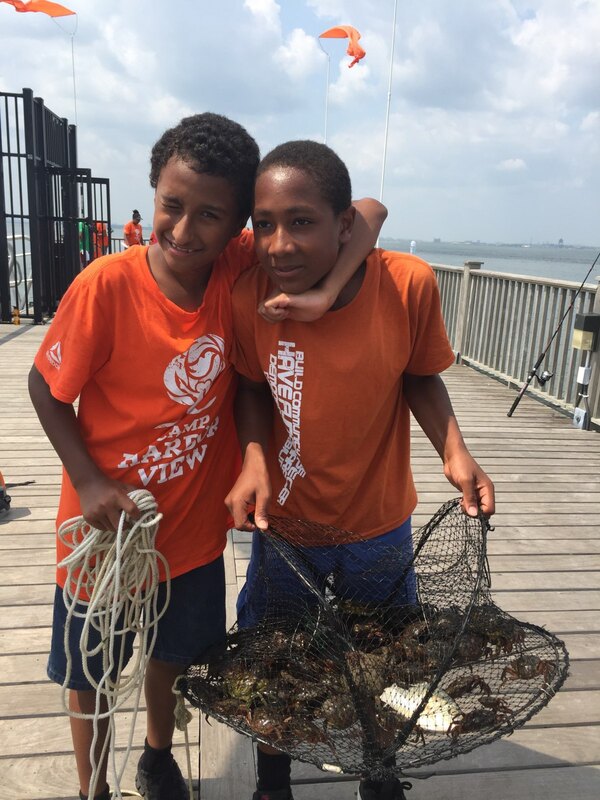 And for a slight moment we are, we're guiding the children, many who wouldn't be able to enjoy such a trip without Save the Harbor/ Save the Bay, to further their curiosity and enjoy things such as fishing and holding crabs! On the boat we walk round and interact with the kids, talk about the latest Disney and Nickelodeon pop culture. 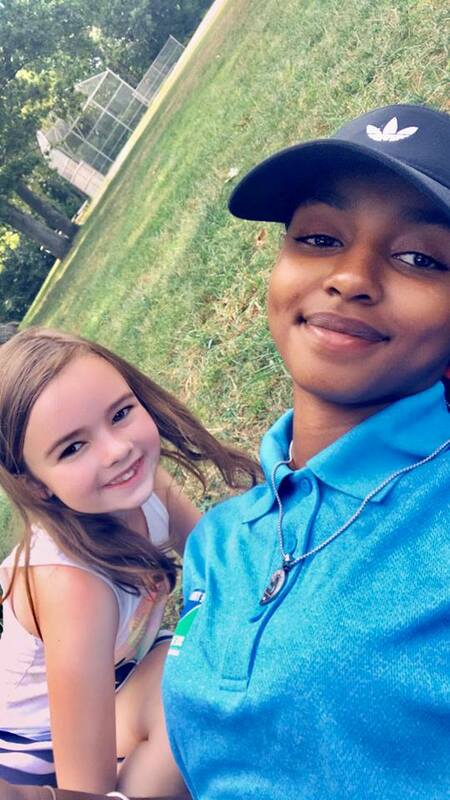 Us Junior Program Assistants and Lead Harbor Explorers feel old with these conversations for the most part. We then break into Moana ballads, and maybe do the 'In My Feelings Challenge.' And just like that 20 minutes have gone by and we're off the boat and onto Georges! Once we get off the boat and onto the island, we set up shop and proceed to fish and play sports! Luckily I got to fish and help a young girl feel confident in her fishing capabilities. She didn't know how to fish and somehow convinced herself it was impossible, after a couple pep talks and reassurance, she grabbed the fishing rod and caught a crab! It was nice to help someone feel better about themselves and try something new! Just like that my first week at All Access was in the books! And I'm already waiting for my next experience! Until then!! For this week's topic I would like to share with you guys the first event I worked. This was the event at Ollie Palooza in South Boston. It was interesting and the setting was a fun place to be at. It was like a little carnival. There was popcorn, snow cones, hot dogs, bouncy houses, water slides, etc. Our fish printing station added on to the joy of all the little kids running around. Fish printing is not what it sounds like. You don’t literally print fish, but then again you do. It’s simple, really. First you choose which colors to paint your fish, it could either be a fake rubber one or a real dead one. After you’ve painted it, you take a piece of rice paper to put on top of the fish. Then you should quickly dab/transfer the paint from the fish onto the paper. When you remove the paper, you should be careful because sometimes if the fish was too wet, the paper would rip. The purpose of teaching kids how to fish print connects to the general purpose of Save the Harbor. It connects them to the Harbor. Nine times out of ten I bet these kids didn’t even know what fish printing was. As they come up to us they ask questions and vise versa. Often even I learn new things. There were many things I didn’t know before doing fish printing at this job. It’s a learning experience for both staff and the children. I didn’t even know what a flounder was or what they looked like. I was shocked when I learned that they swim on their backs, I didn’t know that was possible. We have yet to catch one on one of our rods, but hey, who knows?! See you guys next time! I'm excited to share with you guys how my first fishing derby experience was. If I'm being honest with you guys, the thought of waking up at 6 in the morning and fishing on a boat for about 4 hours did not please me. However, I actually liked it because it was fun. Despite the fact that I didn't catch anything, I had a good time. Unlike the day at orientation, I didn't get sea sick this time! I got to go on Charlie's boat so it was familiar to me. The people in my group were: Aleena, Patrice and her brother, Damani, Kharliyah, Maeve, Bridget, Ariagnna, and Brianna. They're all so nice and we took many pictures/selfies with Bridget! It was a relaxing and peaceful day as another opportunity to spend time with coworkers outside of actual work. Charlie also is a very nice captain, he never hesitated to help us out. Although I tried, I didn't have the luck of catching anything. However, many on our boat did. 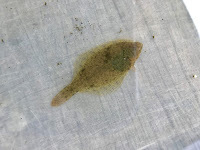 Aleena caught a small striped bass and a baby skate and a few others did as well. I enjoyed my time on the boat, feeling the excitement when one of us caught something. We laughed and smiled a lot, it was great. Fishing this summer was a new experience for me. It's another one of the many things this job has taught me. Summer's almost over and having this skill is a privilege as not many have it. But I do think I've had enough of it, not because I don't like it, but because it requires way more patience than I have. I enjoy passing on this skill to all the kids we get to meet, and I look forward to doing so for these last few weeks! It was the day. The day I would finally get revenge on Eric. It was a 7 am call time, but that didn't matter to me. I was going to make this happen, Eric was going down. When I got there, about half the staff was there and SHE's were waiting to direct people towards the dock. As I was walking down to where we were meeting, I watched as our staff were moving snacks. When I got there, I asked Bridget if there was any left, which was luckily a negative. Heading down to the dock, I saw many people that I didn't know, so I went and talked to them with whom ever they were with. Starting with Michael and his brother. Only half to my surprise, Michael's brother also had a single braid. Apparently the two of them are both avid fishermen. So I talked with them for a bit, and learned that their father had taught all three of them, though the oldest doesn't fish that often. After that, I went to talk to my good friend Colin, who had brought his girlfriend with him. I ended up talking to them for the majority of the remaining time on the dock, but they were interesting conversations. But, the time had come, the time we had all been waiting for! Group photo time! You thought I was going to say fishing time, didn't you? Nope, first we had to get a few pictures of us with the banner in the background. After that, we finally were given a small talk about what we were trying to achieve. There were two trophies to win, one for most fish caught, and second one for the BIGGEST fish caught. So we all got split into different teams and sent to different boats. I had hoped to get assigned to Basil's boat, because he's funny, though sadly I did not. But on the up side, I was put into a boat with Meaghan, whom I have spent the majority of the summer with. On the boat we talked about an assortment of topics, some of which included injuries and then reflecting on their past mistakes. 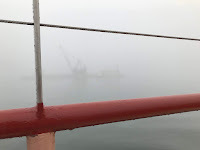 The reason we had gone into the injury discussion was because we had gone into a strait that is dangerous at high tide because of the currents. Our boat captain, who works with the harbor police, had told us a story about how one day he was responding to a boat on fire and how it was just the engine smoking. Just about that time, we had got our first fish. I was the closest, so I was the one to reel him in. Sadly it was too small, so we couldn't keep him. and we continued for a bit longer until all three of our staff had caught one fish each.